Q: Massimo a disappointing result what are your thoughts after such a bad day at the office? Rastelli: Terrible day at the office. We prepared so well for this game and we came out flying and then we switched off for a corner and switched off again five minutes later this was the turning point. I am so disappointed that we gave up so easily, when we went 2-1 down we didn’t look like we wanted to fight back we just gave up and lost the match because we didn’t put up enough of a fight. I think that performance was pathetic if I’m being honest. Q: Fabio a superb victory for your team, what did you make of the game? Cannavaro: I think that this performance was exceptional. The first three minutes they score a beautiful goal but we kept composed still played the way we play and we got ourselves back into the game and from there we dominated and we deserved to win this game. I am delighted with everybody Cristian today scored his twenty and twenty first goal of the season with eleven games left. I also think that Simone (Marino) has been outstanding recently he is really developing into a fine player and sometimes you forget how young he is. 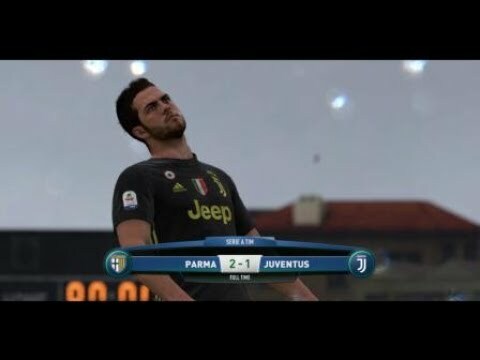 Q: Fabio a draw in the end, do you think that was a fair result? 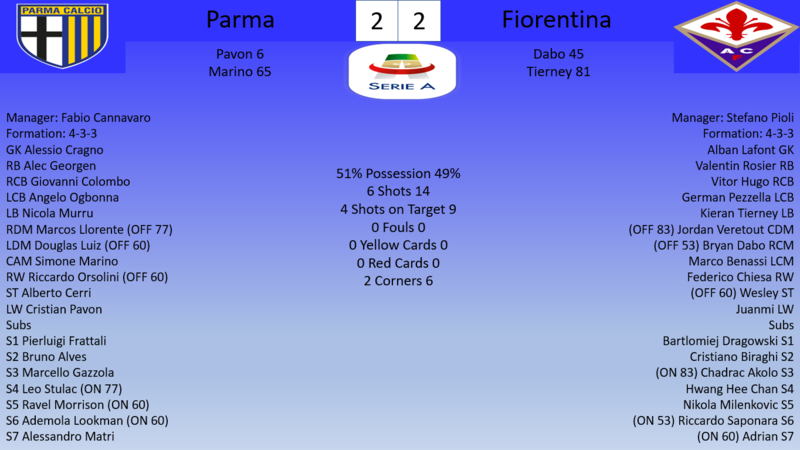 Cannavaro: I believe that the first half the performance of our defence the bravery to throw themselves in front of shots was fantastic also the saves of Alessio (Cragno) it was incredible by them because for me Fiorentina could have gone in with three or four goals but they scored only one incredible goal which nobody can stop. I think maybe they feel they should have won but the second half we improved I am happy to draw these sorts of games. Q: Stefano a draw away against the team with the best home record, are you happy with a point? Pioli: I am shocked. I can not believe we have failed to win here, twice this season I feel we deserved to beat Parma and we have one point to show for it. We started so poorly to concede so early was disappointing but we worked back into the game and we should have been three or four up at the break but we got level just before half time then they scored another goal from us switching off. I suppose we showed character coming from behind twice but man we could have won. Q: Marco a tough loss what was your take on the game? 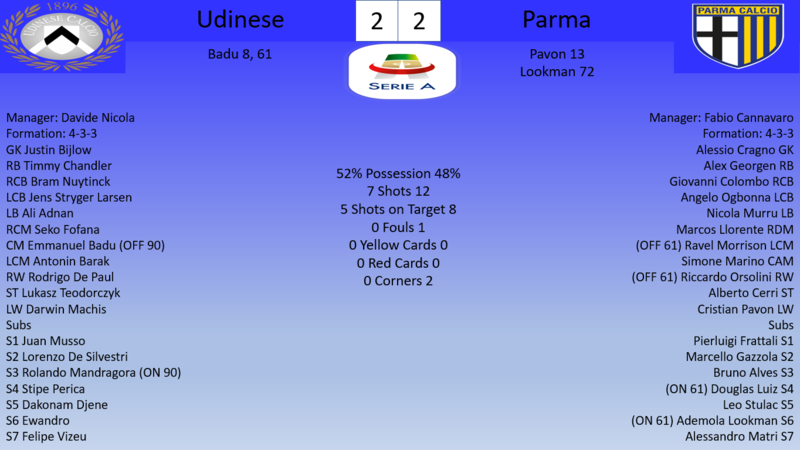 Q: Fabio a superb win away from home, what did you make of that performance and that super strike by Simone Marino? Cannavaro: It was an incredible goal by Simone to score a goal on the volley is not easy but he found the top corner. He has been sensational lately and has started contributing with more goals and assists in recent games. His potential is incredible and we’re lucky to have him playing for us because he is an important player. I thought our performance was very controlled we dictated player and the only real chances they had were from set pieces so it was a solid strong performance. Q: Fabio a fantastic match. With twenty minutes left you were losing did you always believe you could come back and claim the three points? Q: Roberto a disappointing defeat after your side played so well, what are your thoughts on the game? Stellone: We are very sad because we deserved to get something out of the game. 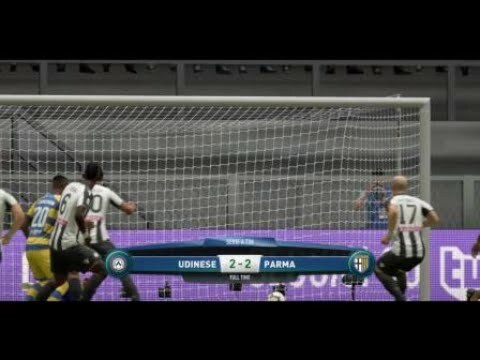 Parma are a great team they are showing that this season but I thought we more then matched them today and we were punished for switching off towards the end of the game. Everybody is devastated because we worked so hard not just in the game but during the week to prepare us for the match and I think we deserved to win the match but small moments in the game cost us. Very good stretch for the team to not lose a game this month. Still in a UEL position but very close to UCL. 7 points ahead for Europe, I think the team will finish in the top 6 which is a great season. The good thing about this team in recent matches is that it seems the scoring is coming from a variety of people instead of just a few strikers. Very good results this month. The good news is that the European spot seems safe at this point and the UCL isn't very far. 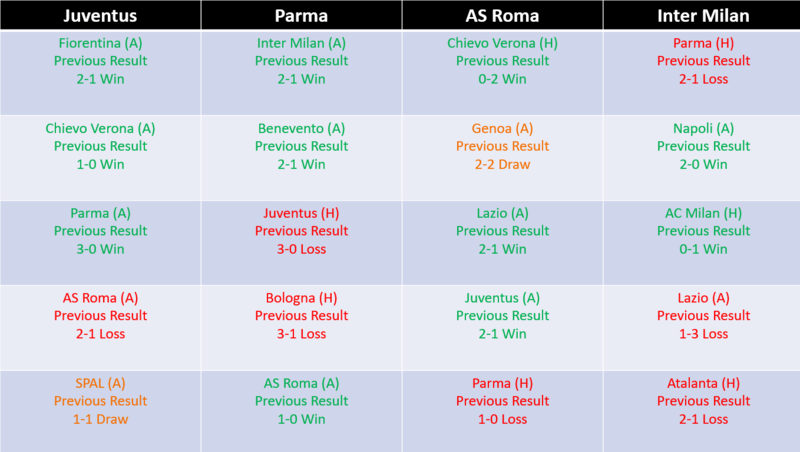 Parma found higher consistency in these late games, so I have big hopes for this last games. Decent run of results here. 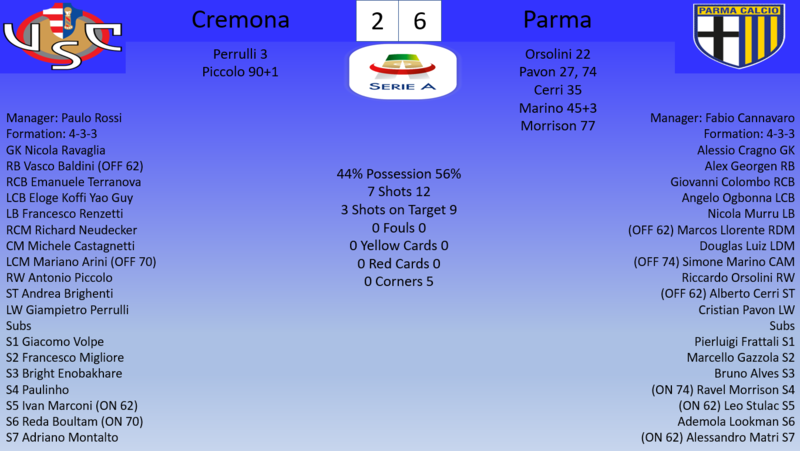 I especially enjoyed watching the smashing of Cremona. After 30 games, the club is doing very well, considering the competition. Brilliant what you’ve turned Parma into since I last checked in. Can’t wait to start following again. Cannavaro getting Parma into the Champions League would hugely raise his market value: he'll have clubs for the taking. 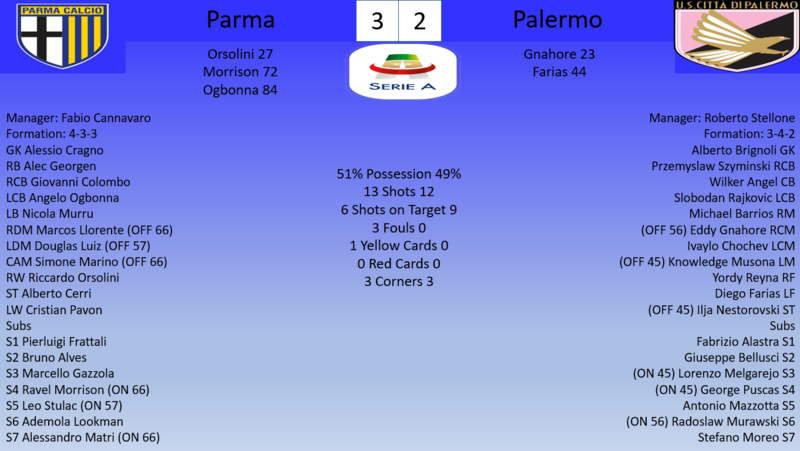 Again very good results and I think you secured at least a top six finish with Parma. For the remaining eight games you can look up to the rest and try to secure a top four finish, do you face some CL spot rivals in the last matches? Q: Domenico a disappointing loss, what did you make of the game? Di Carlo: I am frustrated with the manner of the first goal, we are playing a team in fifth when we are fighting relegation and we get caught on the counter. The second we almost go the interception bu then the finish was excellent by the striker. 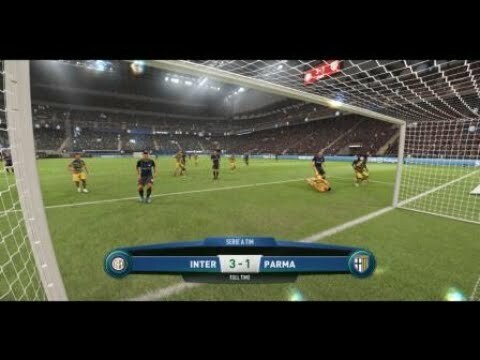 I think both goals could have been avoided there isn’t any shame in losing to Parma but the goals we conceded especially on the counter that’s what disappoints me. Q: Fabio a solid 2-0 win away from home. What where your thoughts on that performance? Cannavaro: I think it was a controlled performance, we defended very well and when we had the opportunity to counter we looked phenomenal and that’s how we got our first goal. 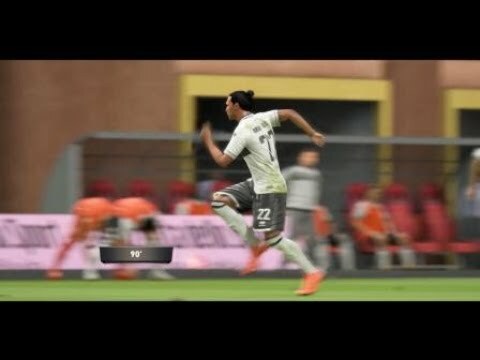 Alberto’s (Cerri) second goal showed what a fantastic striker he is, he doesn’t receive the credit he deserves because he is vital to the way we play his hold up play and the lay offs for Ademola (Lookman) Cristian (Pavon) and Riccardo (Orsolini) on the wings are important plus the knockdowns he gets for Simone (Marino) he is crucial and he deserved his two goals. Q: Davide is that two points dropped or a point gained after leading twice? 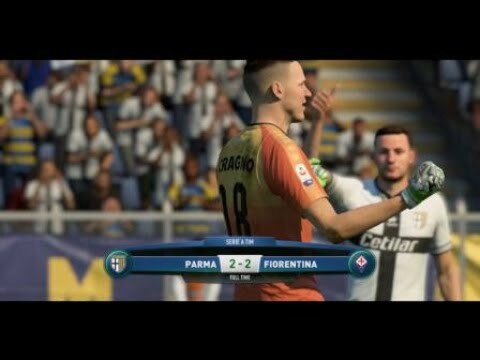 Q: Fabio a 2-2 draw away from home after being behind twice, are you happy with that result? Cannavaro: They played fantastic, sometimes the opponent makes things really difficult and defends well and today I say the opponent was fantastic. Their two goals are fantastic strikes against the run of play but that’s football we had opportunities to score but the opponent was good today and defended well so I am happy to draw because we went behind but kept playing our football. They wanted the draw that’s what I believe they were hoping for before the game and in my opinion they deserved the point. Q: Fabio a comfortable win for your team after a fantastic first half, Your side are now in the top four with five games to go do you believe you can qualify for the Champions League? Cannavaro: Of course, I believe in this team, it will be very difficult because we have five games left and three of them are against direct rivals for the top four but if we play the way we have this season why can’t we finish in the top four. We aren’t here by fluke we are here because we play attacking football that entertains our fans and I think that we deserve to finish in the top four but either way I am proud of my players and the work they have put in this season. Q: Gian a disappointing defeat what did you make of that game? 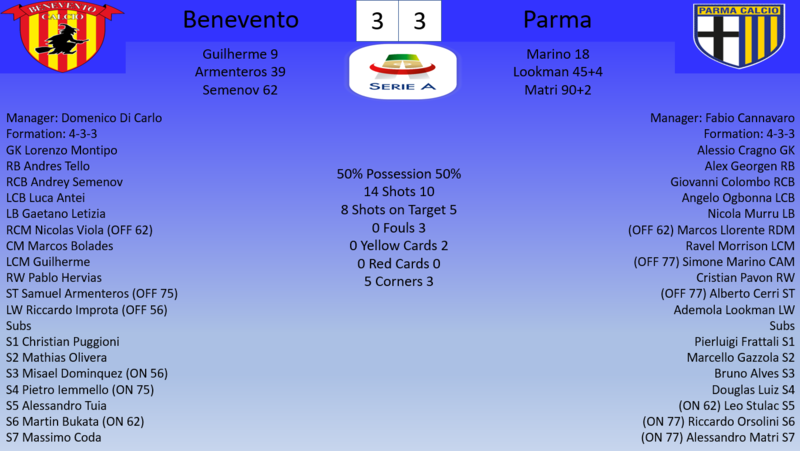 Gasperini: The better team lost today, look at the stats we dominated for a majority of the game but they got the luck. Their first goal I can’t believe how the ball bounced to their striker, the second goal I admit was a very good move and then the third goal the keeper gets a big hand to it but doesn’t keep it out. 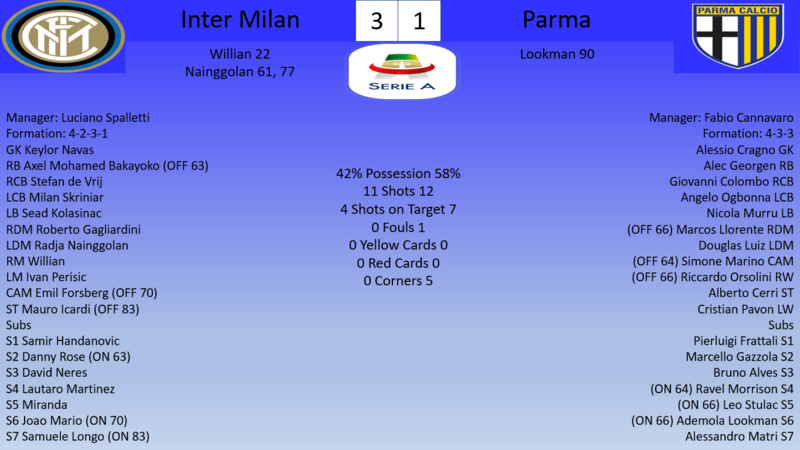 We won’t point the fingers at our players we played fantastic, Parma have the best home record and we came here and dominated against them a crazy five minutes and luck went against us. We didn’t deserve a point we deserved three. With five games left we look at what would happen if in the five games the results that happened earlier in the season happen again. 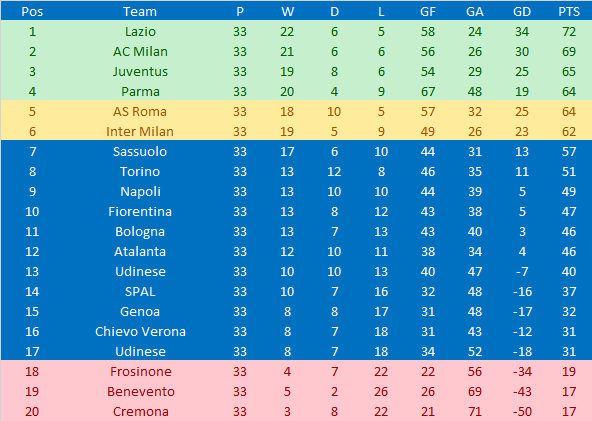 Juventus would finish in third with seventy five points, AS Roma would jump ahead of Parma by one point whilst Inter Milan who have the toughest schedule would finish in sixth place but football is a funny game and with five games left it is still very open for who finishes in the top four. 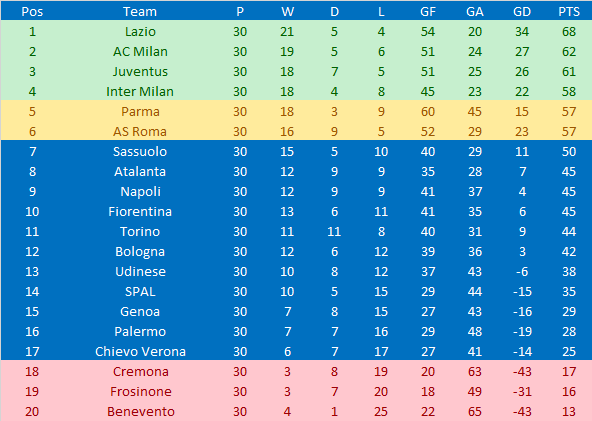 It is a difficult schedule but Parma are in a great position. No pressure as finishing top 6 is still great. And the future is in their own hands with a chance to play all three of the other teams around them. Crazy run of games to end the season. Team has already way overperformed but has a real chance to make some noise now. Looks like there's a genuine chance at the title. Impressed with how the team has been able to outdo themselves during the season. 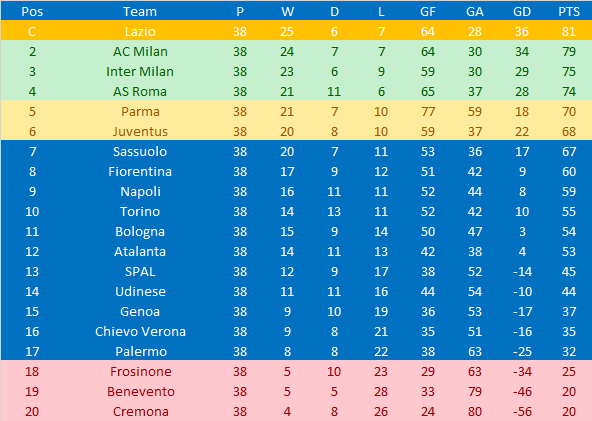 3 of your games are tough but Inter will have to pull off a miracle to finish in the top 4 looking at that. 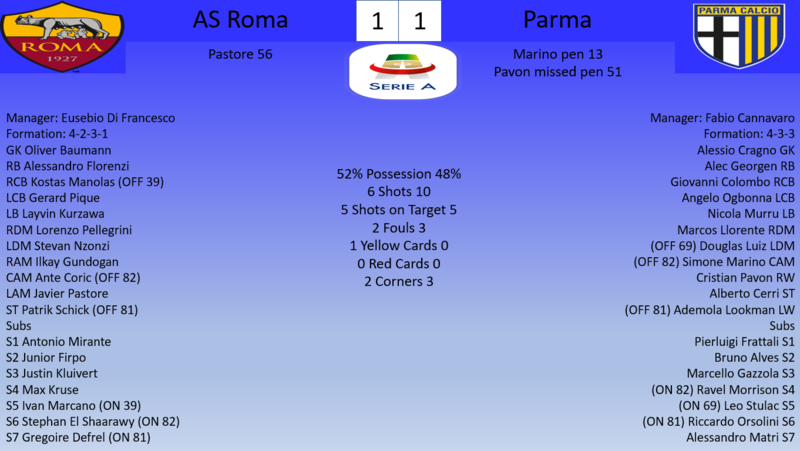 Roma v Parma on the last day of the season could be a Champions League qualification decider! 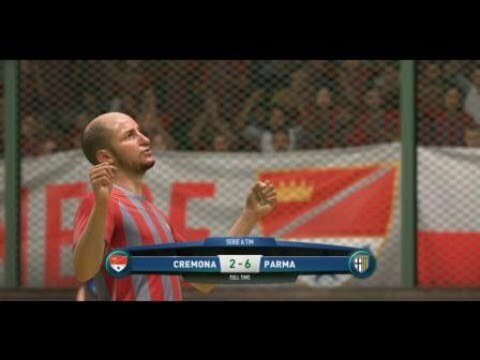 After the good run of results thanks to the great performences of Pavón and Cerri, the team climb to UCL spots. However, tough fixtures ahead, so it's far from secure... the precedents aren't good, but are just precedents. Hopefully the team can respond in this key moment. 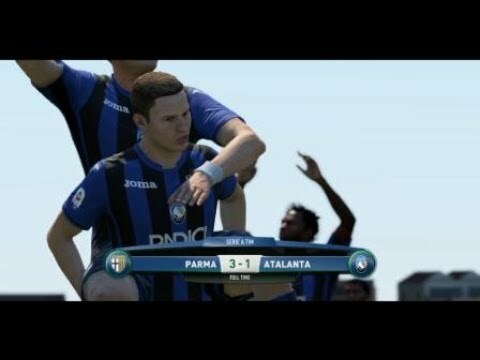 Q: Luciano last week you beat Juventus this week you beat Parma how crucial will these results be heading into the final four games? Spalletti: I think these results are crucial because we have the toughest run of matches, we beat the two teams that were in the top four and now we are in a strong position but our next four games are the most difficult out of all the teams fighting for the top four. 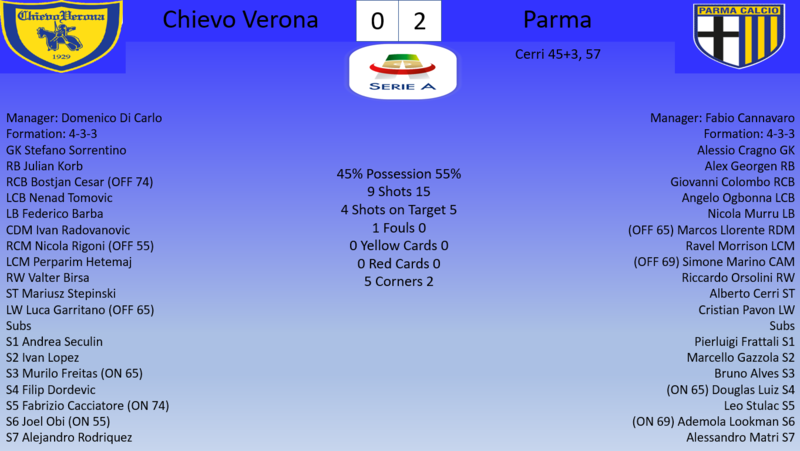 We have to take it one gme at a time today we played a very good Parma team, they came to win but we outplayed them and we deserved the three points. Q: Fabio a devastating defeat, how much of a blow is that to your top four hopes? Cannavaro: We are gutted to have lost the game, I think that it was an even game but we switched off to many times and they punished us for that. They scored some fantastic goals to be fair to them but I do feel the defending could have been a little bit better but we must dust ourselves down we still have four games left and if we win them I’m confident we will be in the Champions League next season. We have to say the four games are cup finals and it is crucial we win them all otherwise I think it will be difficult. Q: Cristian you came so close to the win but that late goal means you have to share the spoils what are your thoughts on the game? Bucchi: We deserved to win this match, we worked so hard throughout the match and to concede a goal in the injury time of the first half hurt but to then also concede in the last seconds of injury time in the second half I think it shows that football is cruel and to many times we have dropped points like this and that is why we are where we are because of these moments. It hurts but we must learn to keep playing until the ninetieth minute. Q: Fabio after losing for so long to equalise in the last seconds is that a point gained or is it the end of your Champions League dream? Cannavaro: I don’t think we played well today but when you analyse this game look at our character and tell me do you think we will give up on our dreams this season. We go behind not once, not twice, three times we fell behind, three times we bounced back and kept fighting until the end of every half scoring goals in injury time of both halves we don’t stop fighting we will never stop we believe in ourselves and will fight until the final day. Q: Fabio a massive win for your side, does that keep you in the race for the top four? 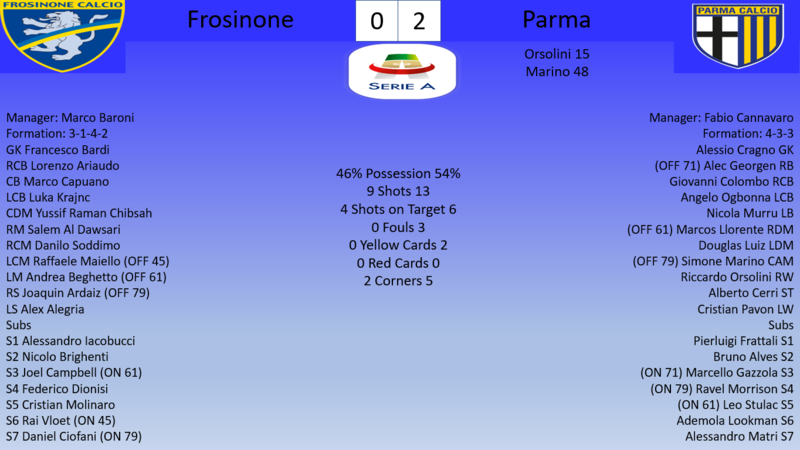 Q: Massimo a disappointing result with an absolute howler from Audero in net. How costly will that error prove to be do you think the top four has gone now? Allegri: I think it was an awful error and it means we are unlikely to finish in the Champions League places. We need a miracle now but we shouldn’t be fighting to finish in fourth we should be fighting for the title and this whole campaign has been terrible. We lost because of two mistakes in a game we should have won it is frustrating because we were the better team on the day and it was a huge opportunity that we have missed but we only have ourselves to blame. Q: Fabio disappointing result after that fantastic win on Saturday. Champions League football is really unlikely now do you still believe you can qualify? Cannavaro: We have to keep believing until the very end of the season, until it is impossible we will continue to believe that we can qualify for the Champions League we have to. I think it is unlikely we know if Inter win against Lazio then it is impossible but if not then still we need a miracle we just have to keep believing that’s all we can do. Today Ademola was incredible and he showed his quality he has been fantastic this season, Everton have a real talent on their hands I hope when he goes back they give him a chance. Q: Filippo a hard fought draw against a team that are fighting to qualify for the Champions League what did you make of the game? Inzaghi: We are delighted with our performance today, they were coming into the game after a huge win against Juventus so we new we had to start brightly and that’s what we did. 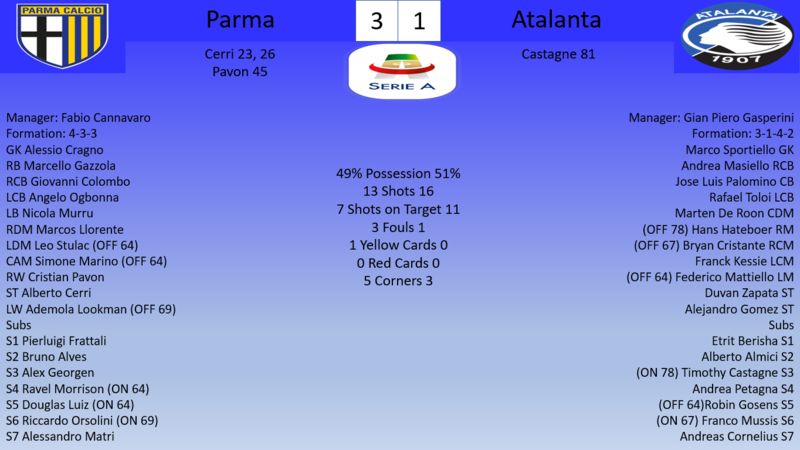 We are a little bit disappointed that we let the lead slip after he bright start but Parma were always going to give it there all to get back into the game and when we went behind we fought hard to find a way back into the game with an excellent finish by Falcinelli. Q: Eusebio after a difficult campaign you have finished in the top four how happy are you to be in next seasons Champions League? Di Francesco: It is always difficult to qualify for the Champions League but we are happy we managed to reach our goal. I think Parma will be very happy with their performance this season, nobody thought they would fight to play in Europe but they have reached that goal and they have done it playing some beautiful football so I congratulate them for that. 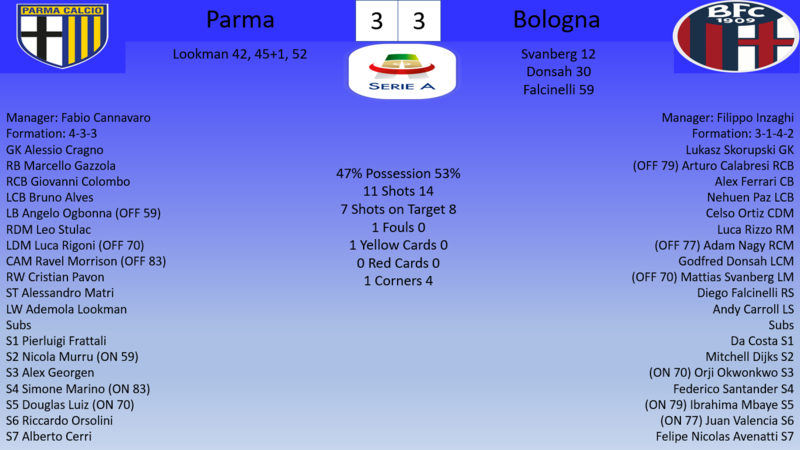 Sometimes experience is key and we had that over Parma it proved crucial. Q: Fabio that’s the end to a quite remarkable season for your team. 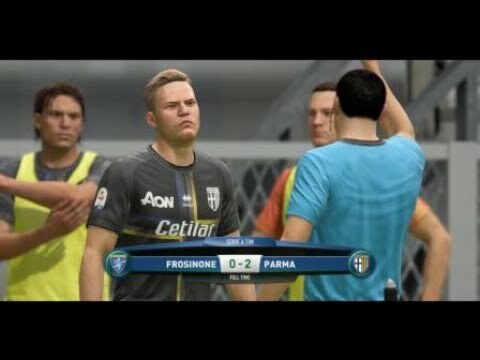 There a lot of speculation about your future now will you be the Parma manager next season? Cannavaro: It has been an amazing season we worked so hard all season and we were so close to reaching our goals but we came up a little bit short. We are disappointed we didn’t win we had the chances to score more but the keeper made a couple of great saves and we finish the season with a draw. I am happy for our performance this season to qualify for Europe was something nobody gave us a chance of doing but we have achieved it I am proud of these players it has been an honour. While the latest results have been disappointing, the season as a whole was fantastic. Nobody expected this team to finish top 10, let alone 5th. First of all congratulations for this fantastic season. Mr. Cannavaro has turn a relegation team to a team that has fought for the Champions League spots until the end. The 5th position is a great achievement. 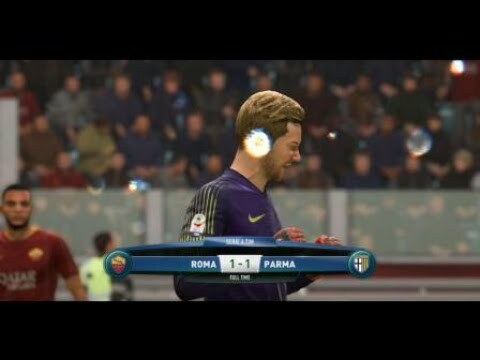 I guess there's a bittersweet feeling as the team dropped points against teams like Benevento or Bologna... or missed penalties in key moments, as the one against Roma. Definitely the last interview sounds as farewell. I was willing to see what Cannavaro could do with Parma in Europe, but I guess offers for him are tempting... waiting for news. 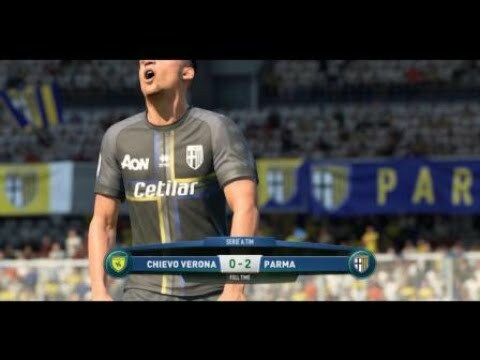 Fantastic season for Parma. 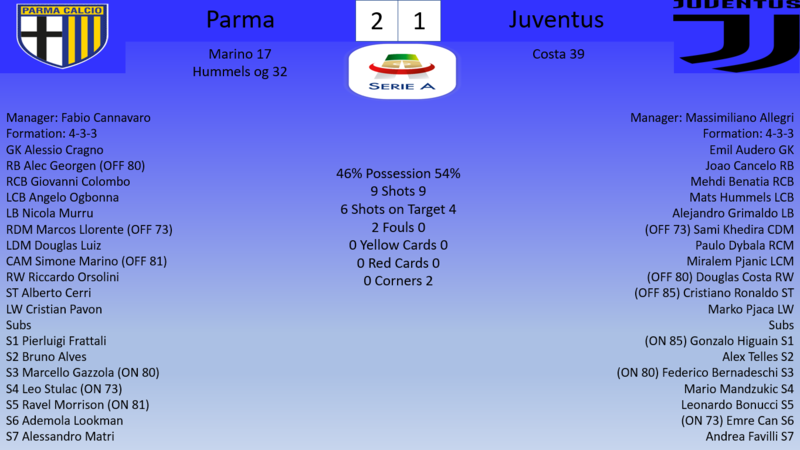 I wonder what will happen at Juve, who heavely dissapointed this season. Would be a dreamjob for Cannavaro if they come for him. 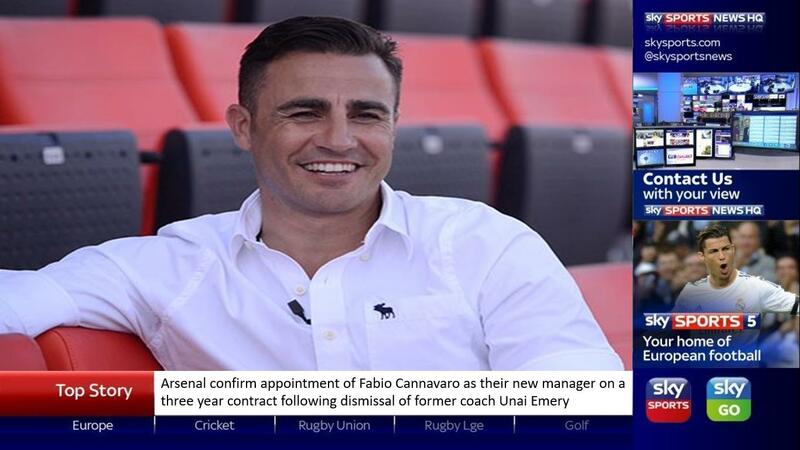 Arsenal have announced Fabio Cannavaro as their new manager on a three year contract after the departure of Unai Emery after another disappointing campaign for the gunners that saw them finish 6th meaning the Gunners will be without Champions League for the fifth season in a row. Fabio who helped Parma to a fifth place finish last season also helped steer Parma away from the relegation season when they looked doomed and Arsenal legend and Sky Sports pundit Thierry Henry has said he feels Fabio is a risk worth taking for Arsenal. Fabio will be holding a press conference on Thursday evening, get your questions in now for Fabio to answer. Question for Fabio- It’s been 5 years since Arsenal played in the Champions League. Some say they have fallen too far behind in the League financially to truly mount a challenge. Can you compete with a much smaller budget than the other big 5? Wow shocking move. Going to the worst team in ALL of London is a challenge. Question for Fabio: Will you try turning Arsenal into the exciting, free flowing attacking they once were or try changing the philosophy and style of everything? I like this choice. It is a club I like and very relevant in football history. I wish Cannavaro can change the trend of the last few seasons. It seems a sad club nowadays.